Tigers: ferocious, majestic, feared. These are the words that you’d normally think of when someone mentions the striped wildcat. Jack Russell Terriers: small, energetic, joyful. These are the words that come to mind when the mini breed is mentioned. 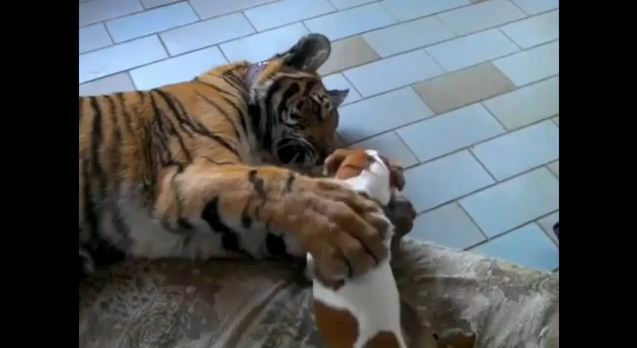 So, what happens when you put a tiger and a tiny terrier – two seemingly opposite creatures – together? This is honestly the most adorable thing I’ve seen in a while. I wish every single animal friendship on the face of the planet was exactly like this. Then again, that would make this less special. So…let’s leave things how they are.